While we do our best to accommodate last-minute registrations, our trips generally sell out in advance and we strongly encourage you to plan ahead and make reservations well ahead of time. Sign up for a two day, adventure-filled getaway. You'll fly through the trees and paddle through big waves on the Deerfield River with this package. Day 1: Dryway Rafting - This full-day rafting trip offers class III and IV rapids for paddlers who are comfortable in the water and ready to dig in and paddle hard. After the rafting, we'll serve a hearty lunch at our base while you look through pictures from the trip. Overnight: Cabin Tent Lodging - Camp out in one of our comfortable Cabin Tents. Each raised platform has a large canvas tent set up on it, with four cots inside, and a small gas grill for simple meals. Day 2: Zip Line Canopy Tour - Start your morning with a three-hour tour through the trees. The trip includes 11 zips, two sky bridges, and 3 rappels. For Rafting, expect everything you bring on the raft to get wet! Best options for clothing : bathing suit and/or shorts in the warmer weather, longer pants and sweater made of wool, nylon, fleece, or polypropylene in the colder weather. Dryway water remains cooler year round. Wetsuits, splash jackets, and neoprene river booties are available for rental if you need them. Sneakers or other shoes that can get wet (no flip-flops or Crocs!). Cotton clothing such as blue jeans, sweatshirts, or t-shirts, is not appropriate for rafting since cotton keeps you cold when it gets wet. All Guests will be required to wear a Zoar Outdoor issued PFD(Personal Flotation Device) and Helmet. To Zipline, wear comfortable clothing appropriate for the season, but avoid loose clothing that could tangle in ropes or other gear. Skirts should be avoided. In late fall or winter months, it is better to come with too many articles of clothing than to come with not enough! We go in the rain, so come prepared with rain gear if needed. You should also remove any dangling jewelry and tie long hair back. Bedding is not provided, so be sure to bring pillows and sheets and blankets (or a sleeping bag). You should also bring quarters for the coin-operated showers as well as shampoo, etc. The paths through the campground are not lit, so please remember to bring a flashlight. Our camping is located a few hundred yards off Route 2 and across the river from a rail line. Train and vehicle traffic varies greatly from day to day, but some campers prefer to use ear plugs on busier nights. We can take adventurers as young as 14 years old out with this package. All guests must be between 70 lbs and 250 lbs. Are meals provided? What if I have food allergies? We provide lunch on our rafting trip, but you should plan on providing your own food for all the other meals. We do not use nuts in our food, but cannot guarantee that the ingredients in our meals do not contain nuts or other food allergens. If you have food allergies or other special dietary needs, we strongly suggest you bring your own bag lunch in non-glass containers and we will pack it with the other lunches on your trip. You're also welcome to call our office at 1-800-532-7483 with any questions about the menu. If you intend to bring your own meal, please let us know ahead of time. While we have an excellent record, the sports of whitewater rafting, canoeing, kayaking, zip lining, rock climbing, skiing, snow shoeing and biking have inherent risks. It should be recognized that accidents can and do occur. For this reason, we cannot assume responsibility for injury or loss of property. Participants in all activities will be required to sign a waiver stating they are aware of the risks involved and are not under the influence of drugs or alcohol. Those with health problems limiting their normal activities may be prohibited from participation at Zoar Outdoor's discretion. Pregnant women will be prohibited from participating in Zoar Outdoor Activities. The packages I see online don't work for me. Is there any other way I can book this? Absolutely! Give our office a call at 1-800-532-7483 and we would be happy to help you customize your package. Whether you want to reverse the order of the activities, book a different lodging option, or see what other options you have, we'll help you figure out the perfect trip. What time does my trip start? For standard packages, the rafting trip on Day 1 starts at 10:30 am. Check-in for the Cabin Tents is after 2:00 pm, so you can check in once you're back from the rafting trip. Check-out for the Cabin Tents is at 10:00 am, so make sure you've checked out before heading to your zip trip. Start times for the Zipline Canopy Tours vary, so make sure you check your confirmation for your trip's start time. The use of recreational drugs or alcohol is prohibited on all programs. If you arrive here under the influence, you will be prohibited from participating in the day's activity and you will not receive a refund. 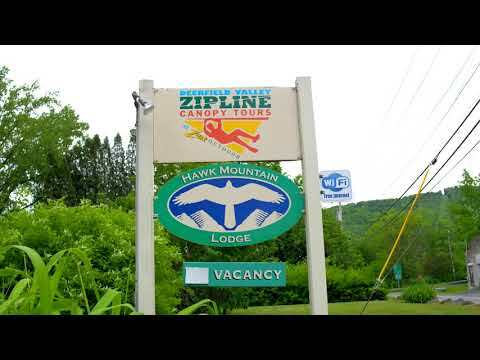 Zip line canopy tours are open to anyone age 10 or up. Participants should be able to hike a short distance downhill and should be in reasonable physical shape. Children under 16 must be accompanied by an adult. We have a minimum weight limit of 70 lbs and a maximum of 250 lbs. Since zip lining is gravity driven, we must adhere to these weight limits strictly for the safety of our guests. We reserve the option to weigh guests when they arrive to determine eligibility for the canopy tour. We can not allow pregnant women to zip. All zip line participants take part in a ground school before getting onto the actual canopy tour. At the ground school, participants must demonstrate the ability to hand brake, self rescue and follow directions from their guides before being allowed on the canopy tour itself. For all of our whitewater trips, guests must be able/willing to do the following: Wear a helmet and our personal flotation device (PFD), respond to and follow verbal or visual instruction, roll from front to back in water while wearing a PFD, demonstrate dynamic sitting position (sitting upright), and float with feet up in water. Specifically for our advanced trips, guests need to be able to paddle for up to 2 minutes at a time. Remain calm, lay flat, and orient their body so their feet are aiming downstream if they find themselves unexpectedly in the water. On the Dryway trip longer unexpected swims in rocky class III/IV rapids are possible, and guests need to be prepared to self rescue by swimming aggressively to shore or other rafts, and/or be prepared to receive a throw rope from shore. Our PFDs fit a maximum chest size of 56 inches. Don't forget to read your confirmation letter (there is a lot of useful information in there!). Call our office if you have any additional questions. We're always happy to help! If you are doing multiple activities with us, it is best to park in our unpaved lot located at 7 Main St. in Charlemont, MA. Head up the stairs towards the red building. There you will find a guide to direct you to the correct pavilion for rafting. Our campground is a self-check-in and you will find a paper map with your name and cabin tent on it located in a wooden box attached to the white board. The main base for our zipline canopy tour is located two buildings down and is painted green. Any of our staff members will be happy to help you find your way around! We run our river trips regardless of the weather. In the event of a weather related cancellation, we would make the decision to cancel on the morning of the trip at Zoar Outdoor and would refund the trip in full. River conditions can vary based on rainfall, snow melt, dam operations and other factors. We reserve the right to modify or move a trip or clinic when we deem necessary based on expected conditions. We run our canopy tours in any weather conditions except lightning and high winds. Weather forecasters are notoriously inaccurate, even up to the day of the tour. Therefore, when it is necessary to cancel due to one of these conditions, we will only cancel at Zoar Outdoor just prior to a tour start. In the event that we must cancel due to weather, we will refund your trip payment in full. Everyone will need to have a separate signed waiver for each activity on the day of the corresponding trip. Once you have signed up for the trip, check your confirmation email for a link to sign your waivers electronically. You can also download and print the waivers here.